For the summer holidays we decided to head to Morzine to meet up with some friends for a week before heading South to the region of Beaufortain. As always it was destination Essert Romand and Les Marmottes campsite. The plan was to bike, chill and if we were feeling brave book a tandem Parapente! As we were the first to arrive in Morzine and a new road bike had just been bought it was time to pick a little route as a warm up for the biking that was to come. 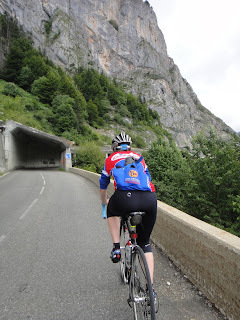 The route took us down towards Thonon turning left and over to the start of the Col de la Ramaz. The scenery was as always fantastic as we passed alpine village after alpine village. The climb up the Ramaz is lovely with a few steep bits but fantastic scenery to take your mind off it! Once over the top of the col we descended and turned left to climb the col d'l Encrenaz back over to Essert Romand. The climb was again steep in places but nothing like we find in the Lake District or Pennines! After a fun descent it was all smiles as the realisation of 2 weeks were to be full of great riding! As with any group once one person lays down a challenge it would be rude not to accept! So the brave 5 people in the group booked with Aero Bi in Morzine for a tandem flight. We were to go in the morning and the rest in the afternoon. Different take off sites but the same thrill! The experience was awesome! Our take off site was above the Prodain cliffs and it was not as scary taking off as we thought but the thrill was amazing. We followed each other along the cliff line towards Avoriaz. We soon turned to ride the cliffs back again. We were flown under a waterfall and at that point a fighter jet flew past us down the valley! It was certainly turning out to be a flight to remember! It was then a race to the landing area over Morzine itself. The landing site was below the Pleney and we were greeted by our friends who were relieved to see us land safe even though their turn was yet to come. All landed safely and we can safely say with a big grin on our faces! It was time to leave the young guns behind and ride the Passporte loop with some variation. 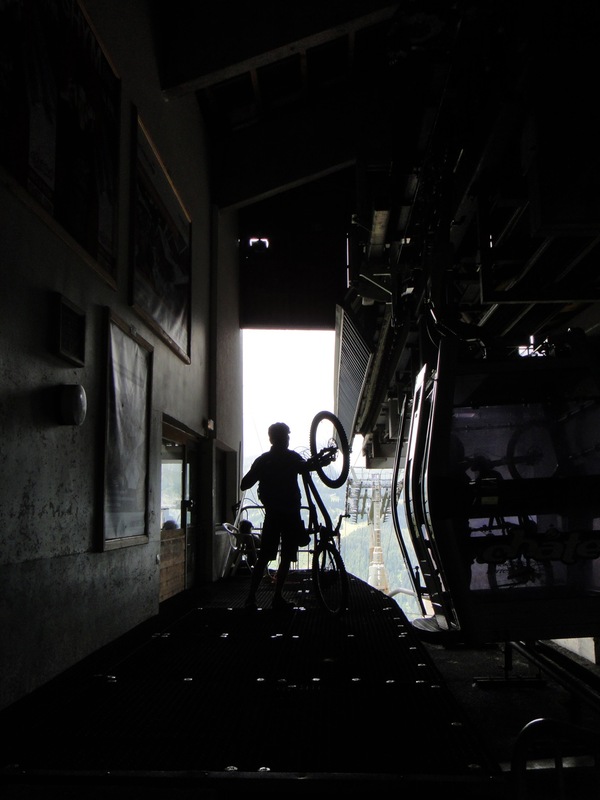 Up early to catch the first lift from Morzine. The usual route of the super highway was taken to Linderet before taking the Cheux Fleurie and heading over to Chatel. With an early start it was soon time for a coffee! The aim of the day was to enjoy and chill and we certainly did that! Heading for the Super Chatel we climbed on very pleasant alpine tracks before descending on great singletrack but only to soon take the road to Morgins. Another lift and we were soon in familiar territory having skied in the area for the last few years. The weather was not great and it was playing hide and seek with the view! Soon it was time to stop for lunch. Having ridden the route in the past a few times we remembered it to be better than it actually was! But not phased we relaxed and enjoyed a lunch at high altitude. 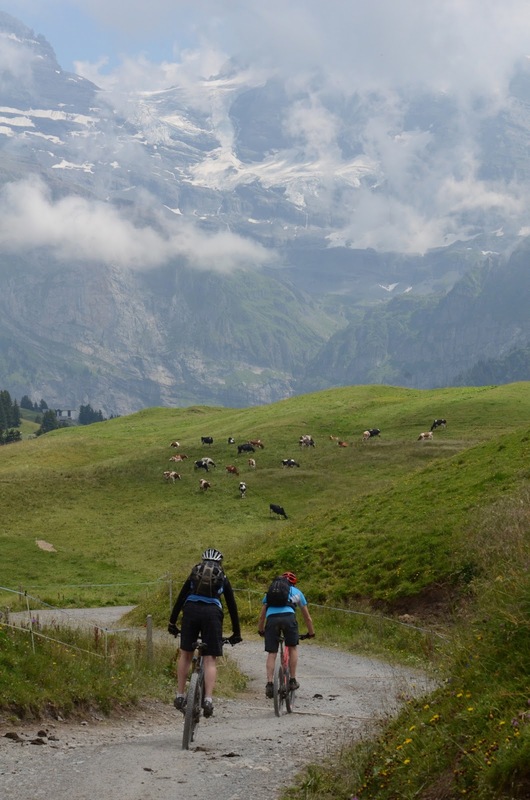 The plan was to avoid the relentless road to Champery and ride fantastic single track down to the town. Friends of ours had tipped us off about a farmer who was stopping cyclists going through his land so the plan was to avoid the farm. Hiking over the top, we were left with a stunning view but as we dropped to the singletrack we were met with an axe wielding farmer who threatened us back to the road. We all laughed this off and worried for the next group of people he threatened if they weren't so accommodating! Anti-social moron! Taking the lift back up from Champery is always an experience but we had plenty to discuss on this trip following our near miss! Soon we were back at the Mossette lift and descending to the green lake. Back at Linderet we took the river route to Lac Montriond and then back down to the campsite at Essert Romand. The ride was overall a good day out but there are many more better routes in the area than this. We decided it was time to travel over the Col de Colombiere to a campsite just outside Beaufort. The campsite was Camping Municipal le Domelin. The campsite was basic but in a close proximity to the town. After the traditional trip to the Tourist Information Centre to pick up maps and MTB routes for the area it was time to plan. The first ride was from a small town called Areches. We caught a bus with a trailer and then realised we had picked the one day that the lift was shut! This meant a 1000m climb up a fire road baking in the sun but with great views to keep us interested! At the top we realised that not having contours on the map has not helped and the lake that we were supposed to be at was 400m below! In true holiday fashion we said sod it and had a nice meal in the refuge that we had arrived at! There was a great view of Mont Blanc!! We decided to be adventurous and take a walking path down to the lake! The singletrack was awesome........ to start with then it became unrideable before once again turning into a great trail, testing every skill!! We eventually arrived at the lake and decided to take a route across to the col de pru and sample a great singletrack descent down to Areches. The trail was undulating to the col but we met many happy walkers which made a nice change! Towards the end of the trail there was a real kick in the gradient. After a little breather we made our way to the col. The singletrack off was graded red on the map and it was awesome! Obviously quite new and not ridden much it was full of steep switchbacks, knife edge trail and steep sections to test your nerves. At the bottom everyone had a smile on their face! 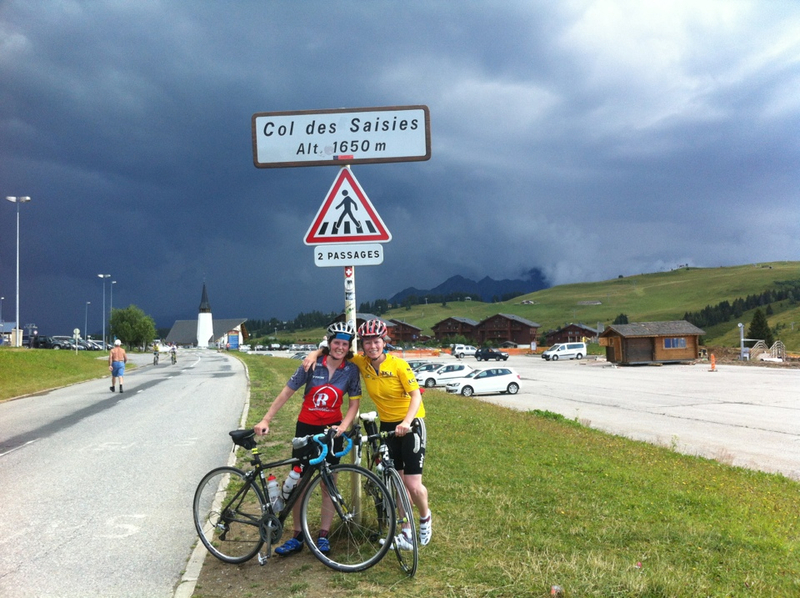 To spin the legs out we took a trip up the Col des Saisies. It was a lovely climb until we looked behind us and saw a huge thunderstorm! We sat it out in a cafe and you could tell the tourists as we ooo and argh at the big claps of thunder!! The next day we decided to ride a route from Lac Roseland. We drove the camper to a parking area on the lake. We headed around the lake towards the top of the Col on the road. As we rounded the lake we came across this stunning church which was well worth a look. The view down the lake was fantastic and very tranquil. The climb on the road was easy going until we met the track that would take us to a col off road above the lake. This was a good challenging climb. At the top we decided to stop for lunch as the view was so good! It is not hard to see how so many people have fallen in love with the Alps. The rest of the route was undulating singletrack before picking up the road around to the Roseland Barrage. Once back on the road it was time to head to the camper and descend back to Beaufort. A good ride with a mixture of different riding challenges to keep you interested throughout your ride. After a well earned BBQ it was time to plan the final ride of the trip. We had tried to find a descent bike shop in Albertville but they were in short supply and not capable of helping with a road bike repair! So MTB it was! The route went from the top of the Col des Saisies. It followed a well used walking path to a refuge and then the guide talked of a great descent! The views of Mont Blanc were stunning and were visible around the whole route. After a quick drink in the refuge we moved to a better view for lunch and a chill before getting excited for the descent! Unfortunately the descent was awful on a land rover track before hitting the road in the valley at the bottom! We were disappointed! The area of Beaufortain has huge biking potential and there were many trails that we did not get to sample! We would certainly consider going back and spending more time seeking out the alpine single track that is littered amongst the stunning views!